As a Practitioner of Clinical Nutrition and Functional Gastroenterology, I’ve discussed small intestinal bacterial overgrowth conditions (SIBO) with students and my patients for over thirty years. It has only been in the past couple years, however, that the topic has become popular and can now be found in articles and ads across the Internet. SIBO is a relatively common condition in which the first portion of the small intestine i.e. the duodenum, normally absent of bacteria due to the periodic washing of this area with hydrochloric acid (HCL) from the stomach, becomes overgrown with bacteria. The bacteria change the environment of the duodenum leading to a host of detrimental alterations including digestive and absorptive issues, impaired immune function and often a serious decline in well-being. Patients may in turn be medically diagnosed with various digestive diseases, skin issues, autoimmune diseases, chronic fatigue syndromes and emotional disorders stemming from the SIBO and treated with drugs missing and complicating the underlying issue(s). The massive number of antacid preparations written by gastroenterologists and other medical physicians has assured this problem’s proliferation (see our video "How Ant-Acids Wreck Your Health"). In neutralizing hydrochloric acid (HCL) production, which prevents bacteria from entering the duodenum, they have opened a Pandora’s box for the creation of health havoc. The neutralization of stomach acid creates great difficulties in protein digestion leading to a reduced ability to utilize them for nutrients while increasing the entry of undigested protein molecules through the intestinal membrane into the bloodstream triggering allergic reactions. Mineral imbalances are also likely to occur, as they are dependent in part on HCL for their solubility. Digestion suffers as the pancreas no longer receives stimulation from the HCL Acid Flow (due to the taking of Antacids) which is required to release sodium bicarbonate i.e. the “alkaline tide”. The digestion of fats and carbohydrates is also hindered with further adverse side effects. The haphazard prescription of antacids has widespread detrimental effects, which patients rarely associate. Prescription and over the counter antacids lead to complex problems for which the patient seeks help from more physicians who in turn prescribe more drugs creating more side effects. Antibiotics also play a role in the development of SIBO, especially when repeatedly prescribed as is often seen in the patient’s history. Overeating, lack of sleep, poor diet, surgical procedures, emotional stress and other drugs also play important roles in the creation of SIBO. SIBO is a common functional disorder leading to potentially serious consequences. It has traditionally been tested for medically by acquiring samples of duodenal fluid and checking for the presence of bacteria. At the Goldberg Clinic, we conduct a less invasive testing procedure that has the patient utilize a home testing kit, collecting breath samples in tubes over two hours after ingesting a small amount of sugar solution. The air samples are sent to a lab to be analyzed for the presence of hydrogen and methane gases. If little or no gas is revealed, the test is negative. The presence, however, of rising amounts of hydrogen and/or methane gas after the ingestion of the solution is indicative of bacterial colonization of the upper small intestine, an abnormal condition found increasingly in the population. 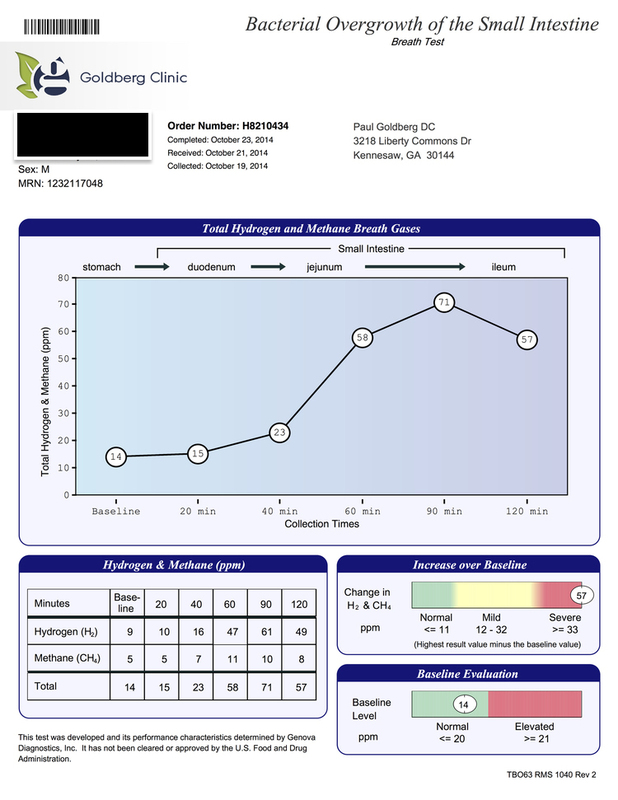 See sample test report to the right indicating Bacterial Overgrowth of the Small Intestine. Medically, antibiotics are commonly given for this condition. While this can produce short-term improvement, long term this is a slippery slope, particularly as antibiotics were often the reason the problem began. The approach taken with the patient must not be based solely on a single test result, but determined individually as to what causal factors led to the issue. Cookie cutter protocols for a positive SIBO test are to be avoided, as the results from such a limited approach will rarely be satisfactory as legions of our patients found out prior to coming to our office. The Internet is full of sales pitches, often touted by young doctors barely out of school (and/or by supplement companies) in the business of selling products based on trendy health interests. Products such as Bone Broth Powders, Essential Oils, Soil Based Organisms, Collagen Proteins, “Super Greens” etc., are hawked to address the latest popular condition. This practice has a long history to it, including selling products for hypoglycemia, candidiasis, food allergies, adrenal fatigue, etc. over the past several decades. Now comes SIBO for yet another round of product marketing. SIBO is a real condition that we see commonly, but it is not the cause of itself nor is it caused by a deficiency of any product. The causes behind SIBO must be identified and specifically addressed. The test results should be viewed by the practitioner with other testing procedures combined with an extensive, carefully taken, patient history and physical examination. Each patient requires an individualized plan along with guidance for carrying the plan through in a structured manner to assure long lasting results. No health restoration program should be based on one factor alone. Practitioners should not be mere showmen selling products; there should be evidence that the practitioner has a high degree of clinical success in working with patients on an individual basis with such issues. SIBO does not exist in a vacuum. Every patient with this condition has specific reasons for having developed it, their own biochemistry and their own detailed history. All these factors must be considered and acted upon in bringing the patient back to health. 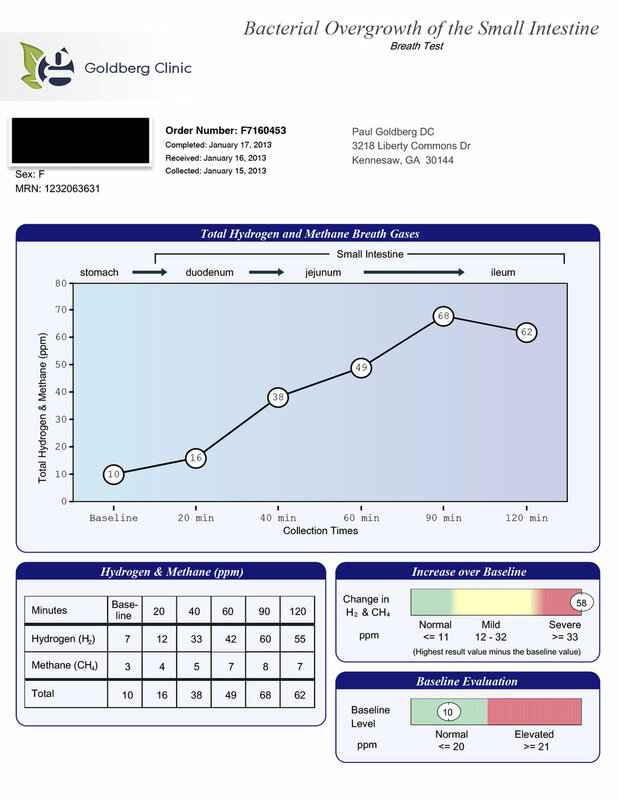 When causes are addressed in each case, a high state of reliable health and vitality is achieved and Bacterial Overgrowth is successfully reversed as evidenced by before/after SIBO test results from our Clinic below. The following are before/after SIBO test results from patients at the Goldberg Clinic. The improvements seen came by addressing causal factors and without the use of drugs or other treatments/therapies. To view more before/after SIBO test results from the Goldberg Clinic archives, click here. To view more before/after SIBO test results from the Goldberg Clinic archives, click here.